One of Heavyweight’s best, Cain Velasquez, returns to the octagon July, 9th at UFC 200. He looks to bounce back from his title defeat at the hands of Fabricio Werdum at UFC 188, who recently and foolishly lost the title by walking into a KO by Stipe Miocic in Curitiba. Since losing nearly a year ago, Velasquez (who has been sidelined by injury again and again) will attempt to get back to his winning ways, when he faces #7 ranked Travis “Hapa” Brown. To get us ready for that fight, lets take a look a Velasquez’s top five fights. In their 2013 fight, “Bigfoot” was coming off of two spectacular knockout wins over Travis “Hapa” Browne and Alistair “The Reem” Overeem. Though he was the smaller man, Velasquez used his superior speed and athleticism to overwhelm the Brazilian Sasquatch. 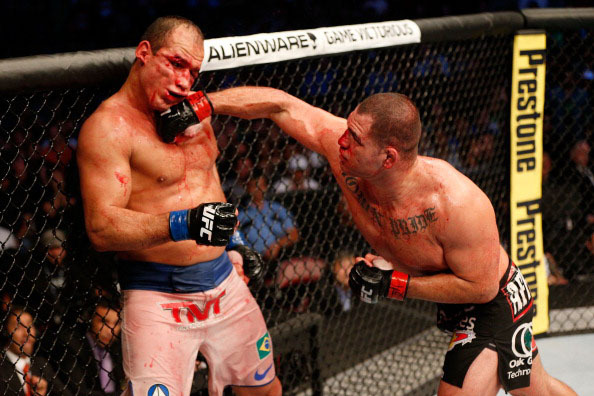 Velasquez’s brutal right hand spelt the end of Silva’s night and marks the beginning of our list. Rothwell (left) assuredly trying to read Cain’s shorts. Back in 2009, Velasquez fought the Wisconsin native who was making his octagon debut. While the stoppage was premature, Velasquez nevertheless, dominated Rothwell as long as the fight lasted. His superior wrestling and powerful striking was on full display and was proof of his unlimited ceiling. Paused to showcase the exact moment Nog’s brain stops functioning. 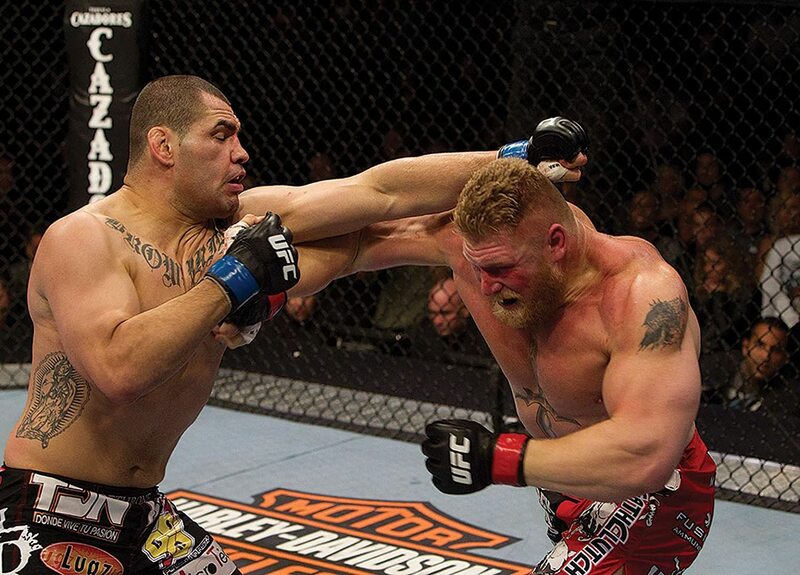 In 2010, the AKA Heavyweight took on the veteran Brazilian in a showcase of his superior striking. His speed, accuracy, and timing worked in tandem, earning him the knockout. Velasquez’s finishing combination perfectly highlights the incredible precision, power, and technique he possesses. Cain will be fighting The Undertaker at Wrestlemania 33. Lesnar came into the fight riding a four-fight win streak and a tsunami of hype. What Lesnar lost in experience, he more than made up for with insane physicality, though that wouldn’t be enough against the gritty Mexican-American. The freak athlete and pro-wrestling sensation was completely dismantled and Velasquez walked away with the Heavyweight Crown. Junior’s pink trunks weren’t the big hit he hoped for. To avoid redundancy this list excludes the second Dos Santos fight, though I’d encourage you to watch that one as well. So much was made of the first two fights with analysts, fans, and fighters unsure of who the better man was. The rubber match between Velasquez and Dos Santos finally put an end to the debate. This bout is possibly the best representation of why many call Velasquez the greatest Heavyweight in the world. 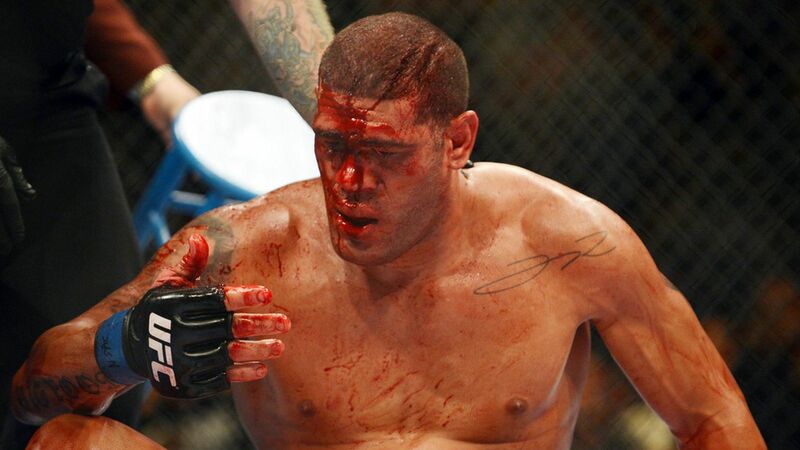 Over the course of nearly 5 rounds (and the five rounds of the previous fight), “Cardio Cain” put a hurting on Dos Santos, so much so that the Brazilian will never be the same. Velasquez’s third fight with Dos Santos marks not only the end of a great trilogy but also our list.